Mr Lurgy has me in a vice like grip, he is being quite the stinker and so i'm laying low for a few days. i'm not completely down and out, no sirree, where there is a will, there is a way! Get well soon. The crafty world would be a sad place if we didn't get your daily stream of inspirational goodness. I will always love you, your blog, your style and your honesty! oohhh I'm so excited. 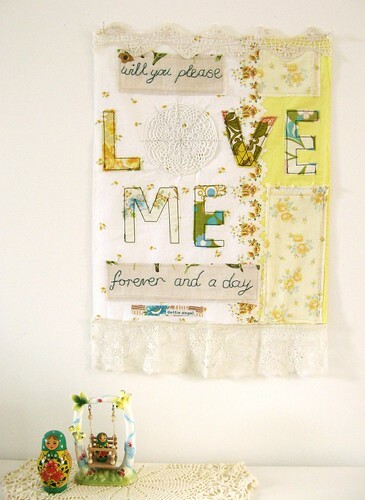 I bought this yesterday and can't wait to have it hanging in my sewing room. I would love to attend your workshop but the 24th is my daughters first birthday. I wouldnt be a very good ma if i missed it. This one really speaks to me. I love it! Oh sweet Dottie, I hope Mr Lurgy releases you soon! Some say he has a brother who has crossed the pond, although he hasn't knocked on my door yet! Well done on stearing clear of Liberty delights! I am having the same trouble with Pip Studio and Greengate! In fact I havent bought a single thing for myself for 4 whole months!! See you on Friday for show and tell! Here's hoping Mr. Lurgy gets bored and wanders off to take someone else in his icky grip, and that you have plenty of lemons, whisky and honey to ease his grip sooner! Just popped onto your lovely blog. Love your style and the colors you use. Hope you are having a sweet week! My dear Dottie, I am so sorry to hear the lurgy has got you. I hope that you feel better soon. :-( Hope you get better soon. You are adorable. Thanks for all your lovely postings, musings and photos. Hope you feel better too. Hugs! I received my new Cloth magazine today and loved your tutorial. Great job! I subscribed in anticipation of your being "published" and I really like it. Thanks for turning me on to it. It has a nice tutorial on how to sew so, coupled with your tutorial, I should soon have plenty of coverings throughout my house! Thanks again and feel better. a blog reader of mine sent me to you. oh my...i am divinely inspired! you are delicious in so many ways. am just venturing out in a crafty, sew-y, way. talked about it on my vlog today. i will definitely come here for guidance. Take your time- we'll be here! Hugs! Sorry your not feeling well...sleep and liquids...take care of yourself! DANG that's a long link!!!! !